Get set to dress up, dance with wild abandon at 100th The Bang! 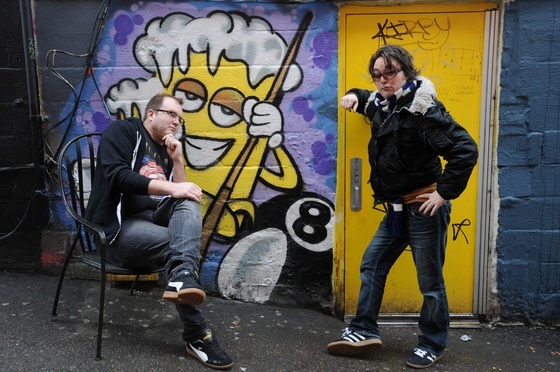 Posted on Mon, Mar 5, 2012 : 10:15 a.m.
Jason Gibner and Jeremy Wheeler, founders of the popular dance party The Bang!, strike a pose outside the Blind Pig. The Bang! will celebrate its 100th party on March 10. The Bang!—Ann Arbor’s long-running, monthly, themed dance party—is about to mark a major musical milestone. The first Bang! was in November 2001, a little more than 10 years ago. That such an event has continued without interruption for so long in the rapidly changing world of Ann Arbor nightlife is a testament to its organizers and to its fans, who seem to drop everything and make plans to attend every time a new Bang! is announced. The Bang! team includes founders Jeremy Wheeler and Jason Gibner, friends since 1976. Wheeler makes the posters and they both compile the tapes (two hours of music each, changing every half-hour). They estimate they have 400 tapes in what Wheeler called “the treasure chest of big-time Bang!-ers” that they bring to each of the shows and display in the entryway. Gibner and Wheeler called the idea of a 100th Bang! “weird” and “bizarre,” and added that when they started The Bang! they had no idea it would last so long. The Bang! "Diamonds Are Forever"
Who: Jeremy Wheeler and Jason Gibner. What: The 100th edition of this long-running local mixtape dance party. When: 9:30 p.m. (doors), Saturday, March 10. How much: $8 (18-21, $11). Info: www.blindpigmusic.com or thebang.net. “People keep coming. People keep having a good time. We’re still having a good time. At the very first one we were thrilled anyone showed up at all,” Wheeler said. “We laugh a lot. It’s really fun to spend time with our best buddies, just get stupid and throw ridiculous parties with themes,” Gibner added. Jessy Trudell, who estimated she’s been to 30 Bang! parties even though she has to make the trek in from Troy, said the party is worth the drive. “It’s not like a pretentious, horrible nightclub—everybody who comes here has a good time. There’s no other place you can dress up and not get judged,” she said. Ypsilanti’s Joshua Redmon, wearing a red shirt with white suspenders and matching pants, agreed. “It’s just a free-for-all, fun and no judgment. Everybody comes here to have a great time and that’s why I like it. Attendance at an average Bang! is around 300 people, said Gibner, ranging in age from 18-35. Most are local, and a good number are college students. Many dress to support the night’s theme (past themes include RoboBang!, BlingBang!, Pajama Jammy Bang! and Back-To-School Bang!). At the Love Bang!, there were plenty of red shirts, pants and heart-shaped accessories, some bordering on the outrageous, others mildly risque. One young woman even came clad as Cupid, complete with a miniature bow and arrow. Although the music jumps from genre to genre (pop, rock, alternative, new wave and rap) and era (anything from the 1950s to the music of today seems fair game), one song remains constant: “Bang Bang” by Squeeze ends each party as a sing-along. “That’s become totally our anthem,” Wheeler said. Tue, Mar 6, 2012 : 2:01 p.m. The Bang is amazing and truly embodies everything that makes Ann Arbor one of the greatest music communities in America!! Congrats on #100!! !